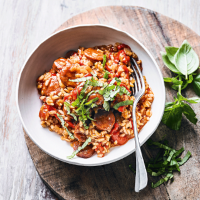 The chorizo sausages give this risotto a lovely rich flavour, but you can also try other Waitrose sausage varieties. Adding the stock a little at a time gives the perfect texture to the rice so it’s worth the extra work. 1. Heat the oil in a frying pan and fry the sausages for 5 minutes to brown, remove and set aside. 2. Add the onion and peppers to the pan and fry for 4-5 minutes, stirring occasionally. Slice the sausages. Stir the rice into the pan and then add the wine and cook until absorbed. 3. Add the tomatoes, sliced sausages, a little stock and cover. Cook gently for 25 minutes, gradually adding more stock until the rice is tender, the sausages are cooked through (with no pink meat) and the liquid has mostly been absorbed. Season and add the basil to serve. This recipe was first published in August 2018.